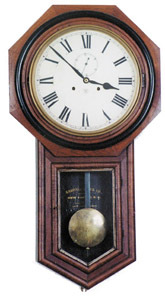 Ansonia Clock Co. "Office Regulator", ca 1901. 32 inch mahogany veneer case. Veneer on the lower rounds but none on the octagon top, which is correct for this model. Ebony trim around the bezel. 12 inch metal dial professionally repainted with logo and seconds dial. Full black label inside. Silver around the lower glass, correct pendulum. 8 day, double wind movement, time only. Ly-Ansonia No.655.